Whenever I decide to go through the box of books we’re getting rid of at work, I tend to pick up certain titles on two main criteria: 1. The cover copy sounds interesting or 2. Hey, I really need to read author/book because reasons. I’ve always heard great things about Mercedes Lackey; if I was a fantasy fan, I really ought to be reading her. And after reading this, I will say that I am interested in checking out some of her other works (particularly the Elementals series, because I am a sucker for fairy tale retellings). 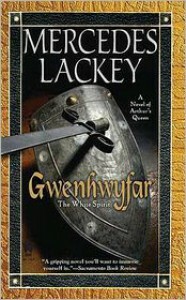 However, I would not really recommend using Gwenhwyfar as a good introduction to Lackey in general.Not to say that this is a bad book—it’s a very well-written character study. It’s just nothing happens. If, like me, you were expecting a deep introspection and reimagining of the Arthurian mythos, it’s really not there. There’s reimagining to be sure, but how Lackey structures it makes the plot suffer. The first two sections are a really fantastic (albeit a bit boring) insight to Gwenhwyfar’s training and life as a war chief; once she gets married to Arthur, everything interesting happens off-screen. The whole final third is what nearly killed the book for me, as it takes a massive derailment to shoehorn this Gwenhwyfar into the standard Arthurian mythos.The big problem here is also the reason why I did like a lot of this book: Lackey decides that the conflicting narratives of Guinevere is that there were really three brides with the same name. (Which is even lampshaded in the book when the titular Gwen is approached about marrying Arthur for political reasons.) I do like the concept; I just think the final execution just does not work. We never see Gwen and Arthur interact outside of a handful of scenes, and I never really get that their personalities and expectations truly clash with one another. We only get one scene of this, where Arthur confronts Gwen about fletching arrows while in the company of her ladies. I wanted this to be a massive conflict—I get that their marriage is purely political in nature, but given what happens in the climax, I felt like we needed more of a glimpse into their relationship. There needs to be more reason as to why Gwen goes to Lancelin aside from that she’s been in love with him and they finally have a chance to be alone together. To be honest, I think that Lackey expected that she needed to stick to the accepted mythology, instead of finding a way to make her retelling fit without compromising her characters. Going in hand with Arthur’s expectations of Gwen, I did have an issue that the message of the book largely seemed to be, “You can either be a woman or warrior, not both; once you choose one, you can never be the other.” Gwen spends a lot of time wangsting over the fact that she doesn’t feel worthy of Lancelin because she’s a warrior (although he reveals that’s why he likes her.) While she doesn’t outright scold her sisters for using feminine wiles to get men, Gwen feels like using such methods are beneath her. The moment Gwen is married off and stuck in a dress, it feels like she’s neutered, seeing as how easily Medraut is able to abduct her. The tell that her sister Gwenhwyfach has replaced Gwen is that she acts like a woman is expected to be. I have a major problem that the main conflict is the result of the Glorious War of Sisterly Rivalry (especially since we only see Gwenhwyfach once between her leaving and Gwen’s abduction; also there’s a lot of accusation towards Gwenhwyfach of being a changeling, and seeing has how fae do play a role in the narrative, I was disappointed that this never played out.) As a character study though, I do really like Gwenhwyfar, and especially for the majority of the book. I like reading about her training as a young girl and growing into a celebrated war chief. I loved her exploits in the charge against the Saxons and her playing up her aptly-named title of “White Phantom.” The scene where Gwen helps her sister Cataruna call up the fae was fantastic, and I liked how it plays out larger into the plot. I even really liked her relationship with Lancelin—despite Gwen’s angsting—and how the two of them truly respect one another. Again, it’s only when we get to the final third and ship Gwen off to Celliwig that I feel like the plot suffers. We never see her get to interact with anyone beyond Lancelin and Medraut at that point, and I really felt like Lackey could have built up the climax.Again, it’s really not a bad book, but the final third feels so lacking and underdeveloped that I didn’t outright love as much as I had for the earlier two sections. I really wish that Lackey had done more of reworking of Arthurian myth to better fit in the climax she wanted, instead of the boring ending that in here.